Technical problems with publishing, an avalanche of post-Olympics TV series premieres, doctor/dentist visits and only so many hours in a day have served to delay an intended earlier report on a very worthy initiative by NBC5. Call me a whiner. Wayne Carter and Samantha Chatman of the “NBC5 Responds” unit have been the point people for these illuminating looks at what ails many an American family. Namely, debilitating medical debt that can strike at any moment. As Carter noted at the outset of the series, NBC5 has partnered with a company called RIP Medical Debt to help forgive what can be a life-altering and sometimes life-crushing financial burden. Companies such as RIP negotiate in the secondary market to “purchase” medical debt for pennies on the dollar. The usual ratio is $100 worth of debt forgiven for every $1 invested. 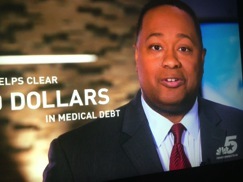 At this point, as NBC5 repeatedly has specified, RIP “cannot forgive medical debt for specific individuals.” Which means the station likewise can’t unduly milk its investment by rolling the cameras and arriving on doorsteps to announce, “Surprise, your medical debt is over! How does that make you feel! ?” Frankly, that’s just as well. The station also has encouraged viewers to donate. And on Friday’s 10 p.m. newscast, Carter said an additional $3.4 million in medical debt will be retired via viewers’ charitable contributions to date. Carter and Chatman have reported companion stories that help to dramatize the urgent needs of families who are buckling under seemingly never-ending medical bills. Carter’s Friday report also presented hospitals’ side of the story via an interview with Stephen Love, who heads the Dallas Hospital Council. “You don’t want the hospital to go out of business, and at the same time you want to be fair to the consumer,” Love said. According to what Love told Carter, hospitals are ”required to have a max price for everything” that’s similar to the notoriously high “rack rates” posted on hotel room doors. This offsets shortfalls when patients aren’t paying up. Carter countered that a $70 price tag for a single Pepcid tablet is not reasonable. Love fully agreed. How could he not? 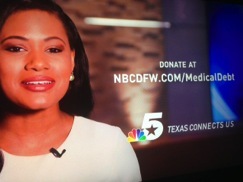 NBC5 deserves major credit for this initiative -- both from a reporting and donation standpoint. Here’s more nuts and bolts information on what the station is trying to accomplish. It’s already accomplished quite a lot.